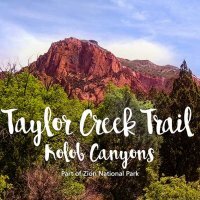 If you haven’t spent time in Zion National Park on the Riverside Walk, you are missing out! As many times as I have been to Zion, I had never spent time here. 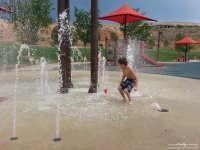 Any outdoor activity that involves water will have the kids smiling from ear to ear. Getting to the Riverside Walk will take some time, especially if you are visiting during months when the shuttles are required to access the park (March – October). Depending on where you get on the shuttle, it could take upwards of 40 minutes to get to your stop. If you walk in to the park via the main entrance by the Visitor’s Center, then the trip will take around 40 minutes, and could take longer depending on how many people get on and off. The Riverside Walk is found at the stop for the Temple of Sinawava trail. This is also the same placed used to access the popular “Subway” or “The Narrows” hike and is the very last stop possible. Once you get off the shuttle, there are facilities you can use. Bathrooms, bottle refilling stations and garbage. The trail is paved and runs along the mountains; you get up close and personal with the rock, which I love. My favorite part of this trail is the optional trail that runs alongside the river. There are designated areas to access the river. One of which is found at the very beginning of the paved trail. It is marked well and easy to get to. My kids didn’t even ask if we were going to the river, but bolted the minute they saw the “River Access” sign. The river has lots of sandy areas and large rocks and logs to sit on. The first area is a great place to spend just enjoying the river and playing in the water. You can continue down the Riverside Walk either via the paved trail or right along the river. The river trail is marked well in some areas, but there are a few spots that move in to the river so you just have to find our way through some rocks and fallen trees, but it is pretty easy to continue. There are also various spots where you can choose to get back on the paved trail or continue right next to the river. Allow the kids to spend some time playing. There is so much to see. It is amazing how close you are to the rocks; it truly makes you realize how small we are in such a big, bold and beautiful world. I loved to spend time looking up to find those random trees and flowers growing out of crevices hundreds of feet above me. A little while in to the walk along the river, we decided to head back to the paved trail. We began our hike late in the afternoon and knew we needed to head back out to the shuttle soon (in spring, the last shuttle leaves at 8:30pm and we promised the kids ice cream at Zion Lodge). As we began to enter the paved walk, we found there are tons of squirrels. Make sure the kids are keeping their eyes peeled. 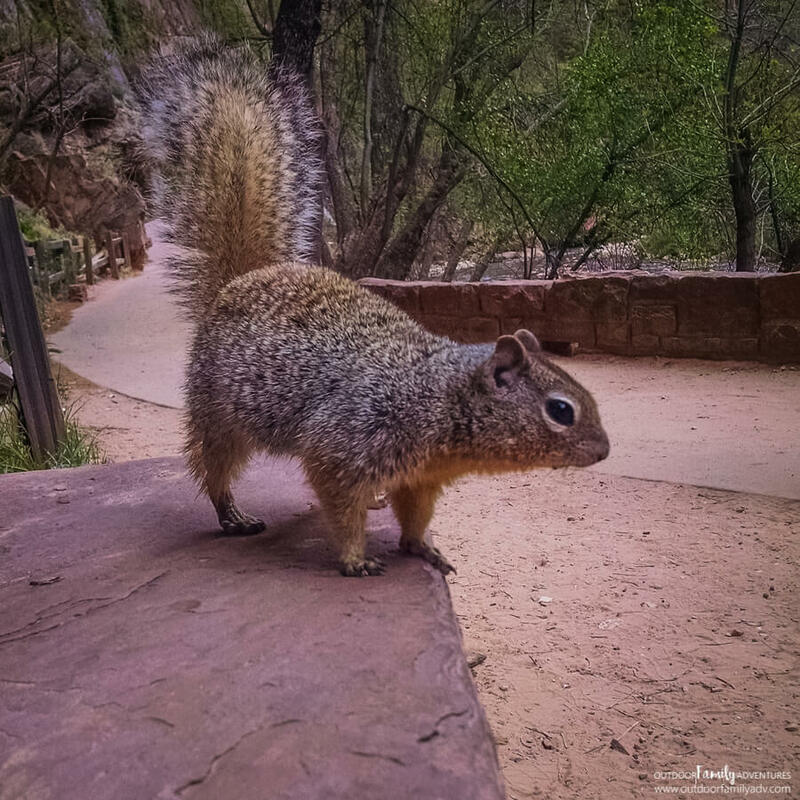 Zion is very clear that they do not want you feeding the wildlife, but based on the plumpness of these squirrels I think they do quite well for themselves, and not because of their amazing scavenging skills. We found a nice rock bench to take a quick snack break on. Before we even unzipped the backpack we had a squirrel running up to our feet and nearly in to my 4-year-old’s lap looking for their next meal. A rogue fruit snack found its way under the bench and the squirrel had it before we knew what to do. Of course his buddy wasn’t too pleased, which led to a full-out squirrel battle. I don’t recommend baiting squirrels into battle with fruit snacks, but should you happen to encounter the same event, it was thoroughly entertaining. I figured that the paved walkway would be a bit boring after we left the river, but there is just as much to see on the walkway! Don’t rule it out just because it is paved and “easy”. The plants and growth alongside the trail are amazing. In some areas it feels more like a forest than the desert. The smell of fresh water running down the rocks was refreshing. 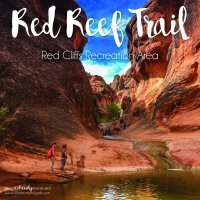 If you continue down the trail, to the very end, you will see the entrance to the Narrows hike and can spend some time on the “sliding rock”. We will make getting to the end part of our next adventure. We’ll make sure to allow ourselves more time and come when the sun is straight above us so we can play in the water while it is sunny. We went around 4pm and the sun was completely blocked from the river due to the height of the rocks (April – spring time). However, even then it was still beautiful and plenty warm. 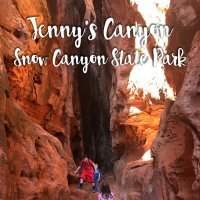 I highly recommend this hike to families. The trail is VERY busy. This is another reason we liked spending time on the sandy trail down by the river. There are so many people coming and going to the other trails at this stop that it is a bit of a hustle and bustle on the trail. At times it felt awkward to stop and look at anything along side the trail. Each time we did, we felt like we were a bit in the way. The trail is narrow most of the time. When I say narrow, I mean that we would need to be single file to allow for both directions of traffic, or I had just enough room to have my 4 year old right next to me. 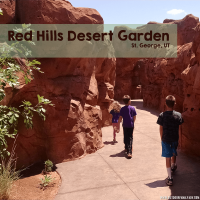 We loved this trail and it is one we will do often. I marked this review as “low cost”, however this just depends on if you buy an annual pass or visit for the day. A day pass to the national park is $25 and an annual pass to only Zion National Park is $50. You can buy an annual pass to all national parks for $80. If you do buy the annual Zion or single park pass and wish to upgrade to the all park pass later, you can just pay the difference ($30), however your pass expiration date will continue off the first date you purchased the single park pass. Note that there are a few steep grades in the second half and portions of the trail may be closed in winter because of ice falling from above. I love the Riverside Walk, but I have to admit that I had no idea you could follow the dirt trail along the river. We always go down to the river and play in the water, but just didn’t realize we could follow the trail all the way up. Thanks for the post! The dirt trail is pretty fun! It was washed out in a few places, but we were able to always find a way around. You’ll have to check it out!